A heat exchanger is a device used to transfer heat between a solid object and a fluid, or between two or more fluids. The fluids may be separated by a solid wall to prevent mixing or they may be in direct contact. They are widely used in space heating, refrigeration, air conditioning, power stations, chemical plants, petrochemical plants, petroleum refineries, natural‐gas processing, and sewage treatment. The classic example of a heat exchanger is found in an internal combustion engine in which a circulating fluid known as engine coolant flows through radiator coils and air flows past the coils, which cools the coolant and heats the incoming air. Study of temperature gradient (optional). In co-current and counter-current modes. In laminar and turbulent flow regimes. Experimental determination of overall heat exchange coefficient values. Theoretical calculation of overall heat exchange coefficient and comparison with experimental value. Comparison of the heat efficiency of the three technologies. Eight temperature readings on the two fluids. Plot temperature profiles in co-current and counter-current modes. Heating unit, power 18kW for hot water production. Integrated temperature controller, circulating pump and safety thermostate. Maximal temperature : 60°C. Hot water feeding: Low and high flow rates flowmeters with control valves, valves to select the exchanger to be operated. Cold water feeding: General insulating valve, heating unit feeding valve, pressure reducing valve, low and high flow rates flowmeters with control valves. Selection of cold water flow, set of two three way valves and two sets of three valves to select the exchanger. High pressure relief valve, tared to 3 bars. 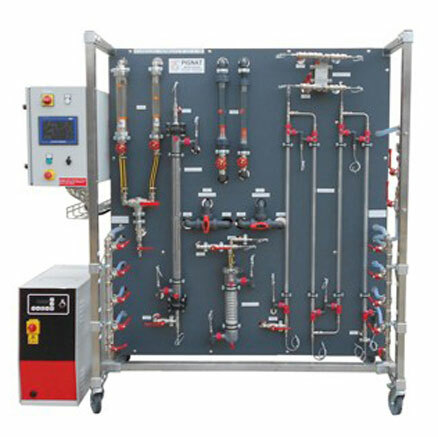 Single-tube glass / stainless steel exchanger EXCH1: Four stainless steel 1m tubes, four temperature probes at inlet and outlet of cold and hot water. Multi-tubular exchanger EXCH2: Five stainless steel 1m tubes, four temperature probes at inlet and outlet of cold and hot water. Plate heat exchanger EXCH3: Welded stainless steel plates, four temperature probes at inlet and outlet of cold and hot water.